With autoimmune disease, the right exercise has the potential to improve our health, but the wrong exercise can cause an autoimmune flare. Our needs will often change from month to month, maybe even from day to day. So, today, I’m going to share my own experience of how my exercise needs have changed since being diagnosed with rheumatoid arthritis. I’m also going to interview 3 other people about their exercise experiences as well. One guest has multiple sclerosis, one has Crohn’s disease, and the other has Hashimoto’s. My hope with this podcast is that we can all learn from and inspire each other. There is no “one size fits all” approach. The wisdom exists in tuning into our bodies and choosing to move in a way that makes us feel better instead of worse. 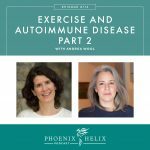 Update 2019: I recorded a companion episode to this podcast: an interview with Andrea Wool, founder of Autoimmmune Strong and an expert on exercise for people with chronic illness. Listen here. Good news! They've cut their shipping charges in half, making winter a great time to place your order. 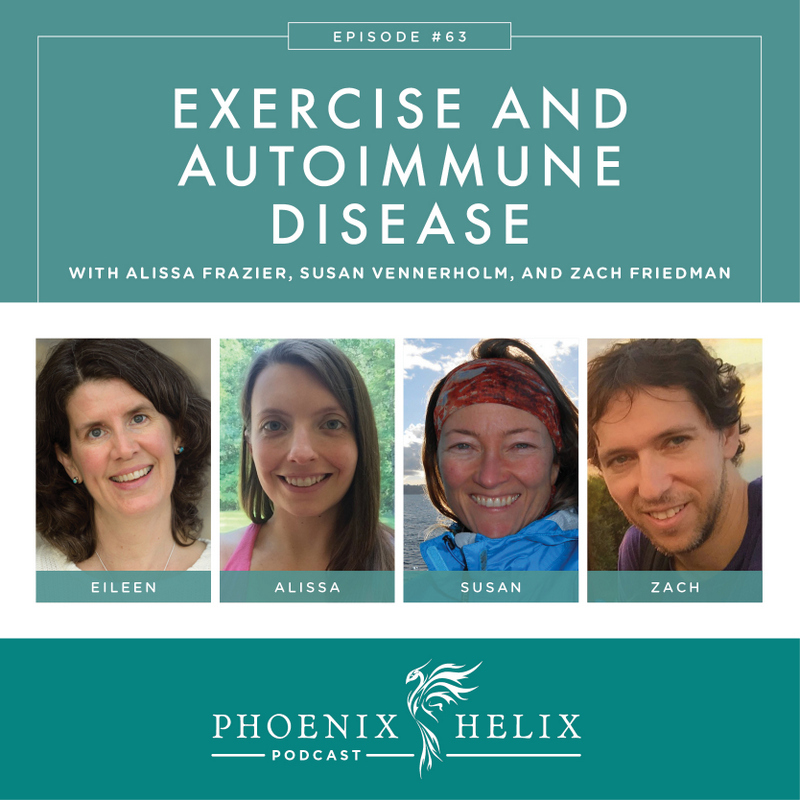 Eileen Laird (your podcast host) manages rheumatoid arthritis with the help of the paleo autoimmune protocol. Pre-diagnosis, I enjoyed mountain hiking, yoga and slow-motion strength training. At rock bottom with RA, all exercise made me flare – even gentle stretches. It simply hurt my body to move. So, I did two things: (1) I meditated which helped calm my fear and incorporated some deep breathing into my life. (2) I “chair danced” – which meant sitting in my “lazygirl” chair, often with a brace on a flaring joint. I would then put on some upbeat music and very subtly move my body to the beat. I mean very subtly! It was a mood lifter, and it felt good to move my body even this much. When my inflammation started to reduce after going paleo, I added very gentle, very short exercise – like 15 minutes on the exercise bike (because walking still hurt), and gentle stretching (because yoga was too hard on my joints). Interestingly, walking and yoga are often recommended for people with RA, showing that universal recommendations don't apply. Eventually, I was able to return to the mountain hikes that I loved, with one change. Instead of hiking 10 miles, I hike 3-5 miles. Interestingly, my body still doesn't like yoga, so I've let that go for now, and I'm focusing on what I can do rather than what I can't. There are ups and downs to life with autoimmune disease, and I adjust my activities accordingly. I used to love kayaking, but some shoulder issues this year made that difficult, so I tried paddleboarding instead and loved it. My best advice: Honor what your body needs in each moment, with self-love, and without judgement. Susan Vennerholm manages Hashimoto's with the help of the paleo autoimmune protocol. 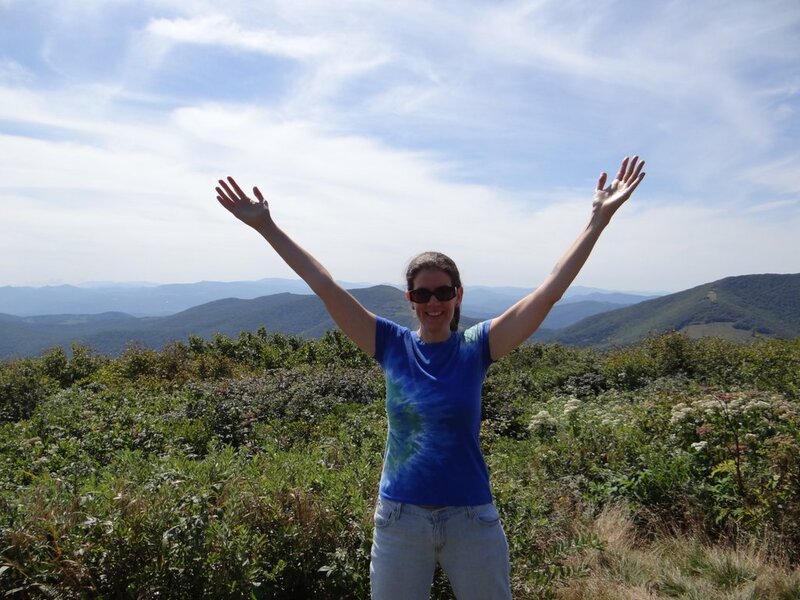 Pre-diagnosis, Susan was an intense outdoor athlete, loving backpacking, mountaineering, trail running, rock climbing, mountain biking, and backcountry skiing. She was also a yoga instructor. Fitness was a huge part of her life. At rock bottom with Hashimoto's, Susan couldn't exercise at all. Going up a flight of stairs made her feel like she had just run a marathon. Adrenal fatigue is a common side effect of Hashimoto's, and it took her 3 years to recover from this double-whammy. 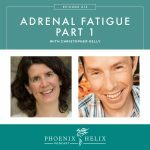 Resources: 8 Key Lifestyle Habits to Support Adrenal Healing, and these Adrenal Fatigue Podcasts: Episode 15 and Episode 47. When Susan began exercising again, she had a lot of false starts, where the smallest amount of exercise would require a 3-hour nap afterward. But eventually she regained her ability to exercise, often finding her limits by surpassing them. She started with short walks and gentle yoga. Eventually she was able to return to the outdoor sports she loved. She also recently started HIIT workouts, which she was surprised to discover she loves. Susan has learned how to pay attention to her body and adjust her exercise accordingly. There are early signs that she needs to rest more; one example is insomnia which is a symptom of adrenal imbalance. Rather than let it become severe, she takes steps to support her circadian rhythms. When she plans a mountaineering trip, she also plans a period of rest afterward. She's more balanced in her approach to exercise now. That doesn't mean she's perfect. Last year she pushed herself too hard and had a shingles outbreak in the remote wilderness, which took months to recover. Her goal is to stop having those experiences by listening to her body's gentler signs. Her best advice: Be patient with your body and listen when it tells you to rest. Get to know your body's signals. And if a form of exercise you used to love is hard on your health, don't give up on exercise altogether. Try different things until you find what works for you. And start gently. You can follow Susan through her blog, Backcountry Paleo. Alissa Frazier manages multiple sclerosis with the help of the paleo diet and lifestyle. Pre-diagnosis, Alissa was on many sports teams in high school. She enjoyed tennis, basketball, and running. During college and grad school her activities dropped off. It actually wasn't until she was diagnosed that she made exercise a consistent part of her life again. She had hired a nutrition coach to help her improve her health, and a fitness routine was part of the recommendation (specifically strength training, which Alissa had never done before). At rock bottom with MS, she had 3 relapses in 18 months. Her symptoms included intense pain bodywide and debilitating fatigue. During those relapses, exercise was not possible. Rest was what she needed, but it was really hard for her to accept that, because she loved her exercise routine. Kettlebells are a cornerstone of Alissa's personal exercise routine. One of the things she likes about them is that you can adapt the weight and the movement based on your body's abilities, from something very gentle to something very challenging. Alissa has also had the experience of finding her body's limits by surpassing them. Sometimes if she pushed herself too hard, she would experience minor flares that lasted for a few days. She was also exercising strenuously before her 3 major relapses, and while the heavy exercise wasn't the sole cause, it might have contributed. Alissa has been able to get back to the advanced strength training she was doing prior to her relapses, and she also enjoys playing some tennis. But she has learned to adapt to her body's needs. For example, heat intolerance exacerbates MS symptoms, so Alissa chooses to play tennis in cooler weather, on a shady court, for shorter sessions, and she has ice water available. She's also given up running, because she doesn't believe chronic cardio is good for her health. Her best advice: When starting a new exercise routine, always start easy and slowly ramp up. If you can work with a personal trainer who knows about autoimmunity, that's ideal. Don't let yourself by defined by your diagnosis. Almost any exercise can be adapted for your needs. You can follow Alissa through her blog, Liss-MS.com. She's also a personal trainer and health coach who works with people worldwide via Skype. Zach Friedman is managing Crohn's disease with the help of the paleo diet and lifestyle. Pre-diagnosis, Zach enjoyed volleyball, hiking, salsa dancing and Qigong. At rock bottom with Crohn's, Zach had already had one surgery, and within 3 years his doctor was recommending another. Simultaneously, he was having a negative reaction to his medication, causing nausea on top of his Crohn's symptoms. His doctor recommended Hot Yoga, which Zach found very beneficial and soothing to his symptoms. After a 2-hour class, he would feel better for most of that day. He thinks part of the reason was that the sweating helped him detox some of his medication side effects. He now has a daily exercise routine he does every morning that has a direct effect on his Crohn's symptoms. He drinks a glass of water, then does a series of stretches and gentle yoga – largely focusing on stretching his core. Then he drinks a second glass of water. Sometimes his routine is just a few minutes per day, yet after years of doing this, he feels stronger and more flexible than ever before. He experiences much fewer Crohn's symptoms on the days he does this routine (which he has learned by occasionally skipping a day). In addition to his daily stretching routine, Zach has been able to get back to some of the activities he enjoyed pre-diagnosis, including volleyball and hiking. He does have to take care of his health, especially when he's hiking in remote regions. On a vacation to Yosemite National Park, he had a severe flare brought on partially by the high altitude and dehydration. Now, he knows to make sure he drinks plenty of water and be especially tuned into his body's needs in challenging terrain. His best advice: Exercise doesn't have to be strenuous or time-intensive to be helpful. The important thing is consistency – doing what you can every day, even if it's just a little bit. You can follow Zach through his blog, myPALeos. Help me reach 100 positive reviews. I currently have 92 five-star ratings in iTunes and would love to cross the 100 review threshold. It really helps new listeners find the show and know that the information we share here is valuable. Step-By-Step Instructions on How to Leave a Review. 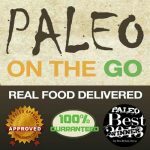 Vote for Me in the Paleo Magazine Awards: I'm in the running for best podcast (Phoenix Helix) and best ebook (Paleo AIP Instant Pot Cookbook). Vote here: http://paleom.ag/pmbest17. Autoimmune Strong: This is a membership website that provides video tutorials, community forums, and other resources to help you build strength in a way that's safe for your body. Use the code PHOENIXHELIX for $10 off the first month. Update 2018: Yoga for Healing is no longer available.